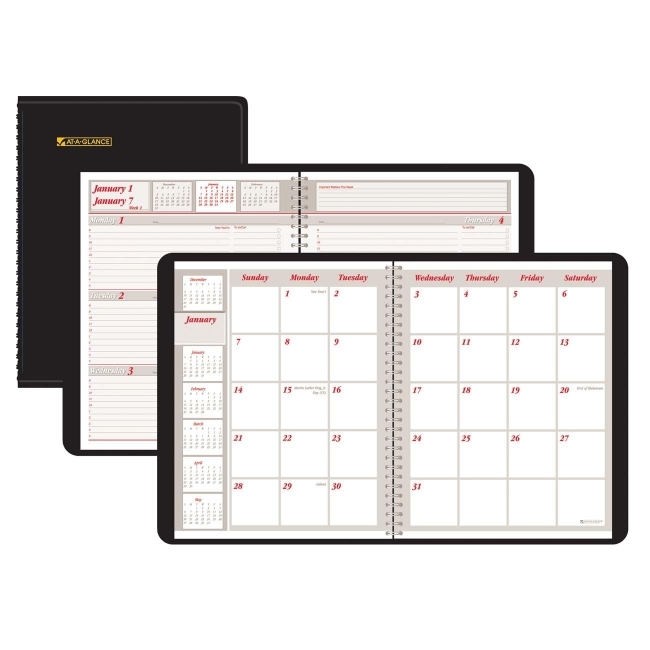 Media Size: 6.87" x 8.75"
At-A-Glance 70-650-05 Dated Executive Appointment Book - Black 6.87" x 8.75"
Dated executive appointment book features weekly and monthly formats. Planning pages range 12 months from January to December. Ruled weekly format includes two-page-per-week spreads, hourly appointment times from 8 AM to 5 PM, priority checklist, plus previous, current and future months reference. The monthly format features two-page-per-month spreads, expense section, and Julian dates. Wirebound appointment book has a simulated leather cover. Calendar pages are printed on quality recycled paper with 30 percent post-consumer material. Nonrefillable.